It shows which roads that are already decommissioned and those that are about to be in the near future. It still looks like I will loose one of my favorite campsites and a road I thought they were going to decom that they are leaving alone. So not too many surprises! I got one of those letters too. Did I read it wrong, or are they decommissioning 7010-160 - the road that goes to the Baty Butte trailhead? As far as I can tell that road is green, so no it will stay usable. That was one I was worried about too. Even though we have located about half of the abandoned trail (South Fork Mtn.Trail) down Stroupe Creek there are I believe 3 clearcuts between what we know and the 7010 road. Rob the 7010160 road past the trailhead will be decommissioned soon, parts further out have already been decom. Those roads that are red with black marks beside them are already decom, those marked red are to be decom, green roads will stay open. Those roads with blue lines along them are being converted to trails, mostly ATV trails, but some hiking trails. The end of 4611, about .5 miles of it is to be decom, not sure if that is past the trailhead or before it. That piece of road was about to go anyway without some maintenance the last time I was out there. The last 1-1/2 -2 miles of the 4611 road are in the new wilderness area anyway so we can probably say bye-bye to that access to Huxley Lake and other trails especially with all the ATV damage that has been going on even after wilderness designation. Yeah, now I see it - that map is hard to read since it has no labels or trails for reference. It is hard to tell, but I think (hopefully) that access to Grouse point and the lower end of Huxley will still be available. 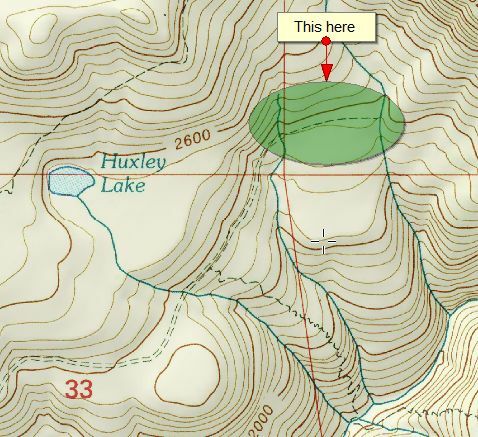 One interesting thing I just noticed - the current topo map shows a trail from the end of 4611 to the unnamed creek that goes down into the roaring river. Might have to make a trip up there next year to see if there really is a trail there! I hate that map too, no road numbers, trails, or wilderness boundaries. Yea, I'm not sure either on that 4611 road. You can't drive as far as that topo you posted because it is partially decom. If I remember right, the last time I was out there 3-4 years ago with Bob , that road seemed more like an old railroad grade when hiked it out a mile or so. They did have the railroad up on La Dee Flat, but I'm not sure how far they went out towards the Roaring River. I can't imagine them leaving a road out in the wilderness especially with all damage the ATV's are doing out there the way it is. If they do cut the road back, we could use the old trail from the Winslow pit the ATV's are using that ties into the Huxley Lake Trail.